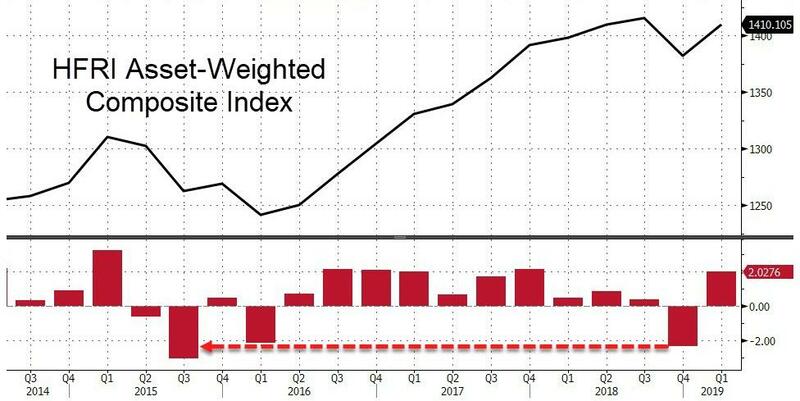 That hedge funds had a tough Q4 should not be a total surprise, as the HFRI Asset Weighted Composite Index fell -2.37% in the volatile quarter. But, as HFR reports, new hedge fund launches have sunk to their lowest level since the start of the century as untried managers struggled to attract capital in 2018, a year of widespread disappointment for investors in the asset class. Just 561 new hedge funds were launched in 2018, the lowest number since 2000, according to HFR, the data provider. 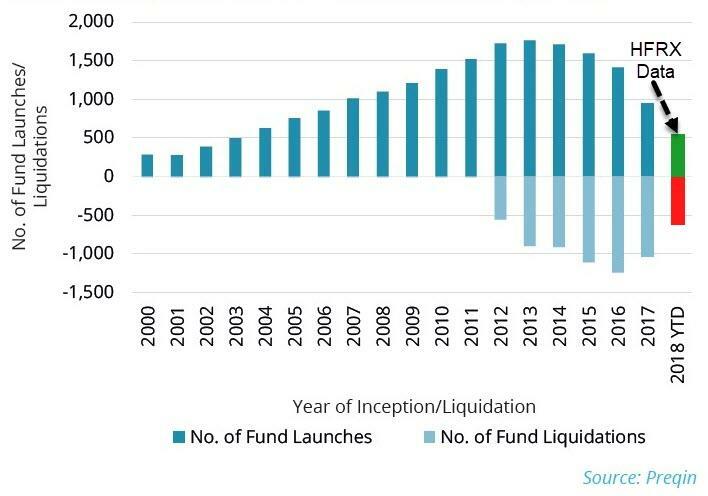 Fund liquidations rose in 4Q18 to an estimated 215, the highest level since 2Q17, when 222 funds closed. The FT reports that hedge fund debuts have fallen steadily since 2011 as capital-raising conditions have become more challenging. Don Steinbrugge, founder and chief executive at Agecroft Partners, a Virginia-based consultancy, said the industry was “approaching saturation point” and any “new” inflows would arrive mainly from reallocations of existing capital held by rival managers. 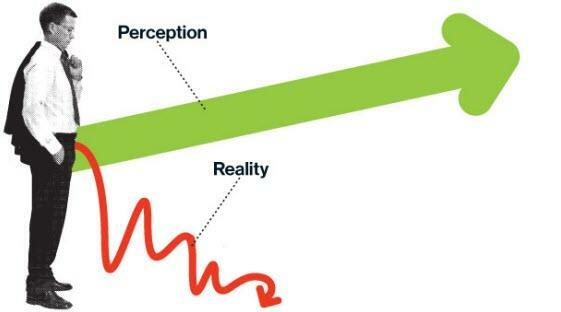 “The composition of the hedge fund industry’s investor base has also changed over time. Allocations are now dominated by large institutional clients that have a bias towards larger managers. Competition to win seed capital is also intense so it is increasingly difficult for new managers,” said Mr Steinbrugge. Average hedge fund management fees remained at the lowest level since HFR began publishing these estimates in 2008, while the average incentive fee fell slightly from the prior quarter. The average management fee remained unchanged at an estimated 1.43 percent, while the average incentive fee fell narrowly by -3 bps to 16.90 percent. 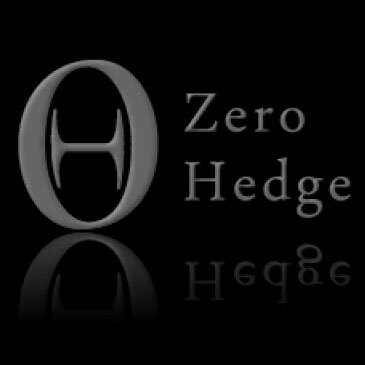 As reported previously, HFR estimates that only approximately 30 percent of all hedge funds currently charge equal to or greater than a “2-and-20” fee structure. "Despite performance gains across larger Macro and credit multi-strategy funds, powerful risk-off sentiment and a steep drop in investor risk tolerance as financial market volatility surged in 4Q inhibited hedge fund launches into year end, resulted in the lowest quarterly launch total since 4Q08 and lowest annual launch total since 2000. Liquidations also declined in the year, indicating that more investors are remaining with funds in which they are currently invested," stated Kenneth J. Heinz, President of HFR. "While investor risk appetite has returned in early 2019, the environment remains challenging for new fund launches, with increasingly institutional capital sources indicating preference for established funds, new launches by established firms or demonstrated performance track record combined with rising investor capital bases. The volatile year end is likely to accelerate the institutional investor pressures for lower fees and greater liquidity, as well as performance, with conformity of these trends driving industry growth through 2019." With the surge in passive investing and the Powell Put under the market, why would anyone need a 'hedge' fund? As The FT concludes, years of disappointing performance have led investors to be more reluctant to bet on start-up managers and untested strategies.